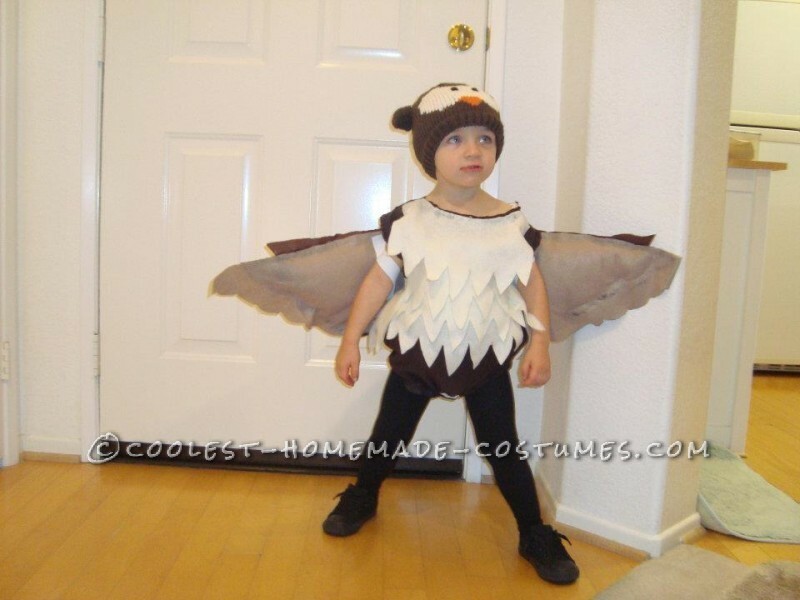 This owl costume for a little boy started with one thought in mind “I will not buy a costume this year because they are WAY too expensive! 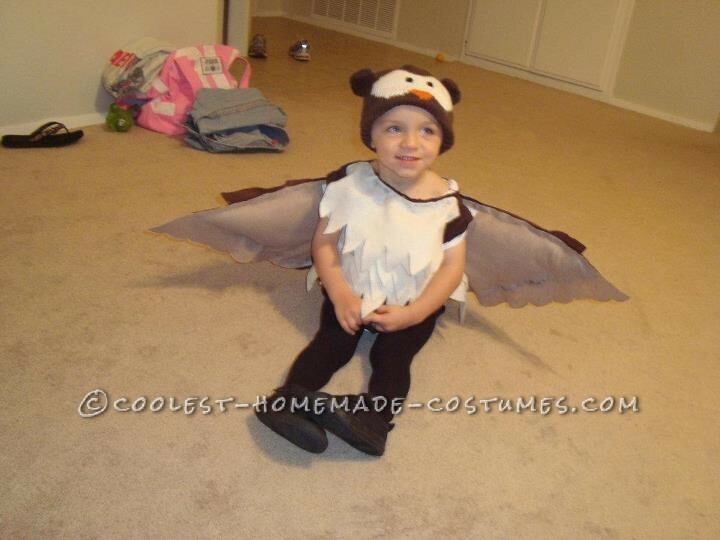 !” It took about 2 months to decide that he should be an owl. I think deciding what he should be was the hardest part. Once we landed on an idea it took off from there. I went to the local fabric store and bought a stretchy brown fabric (body) and three different shades of felt (wings) some strips of elastic and 2 bags of teddy bear stuffing. I also bought a hand sewing machine (bad idea, I returned it after trying to use it for 2.5 hrs with no luck at all!) and a hot glue gun (best idea ever, I used it for everything). For the body I used a regular child’s onsie and sewed the stretchy brown material at the openings (neck, arms, legs). I then stuffed the “body” to make the round owl body. 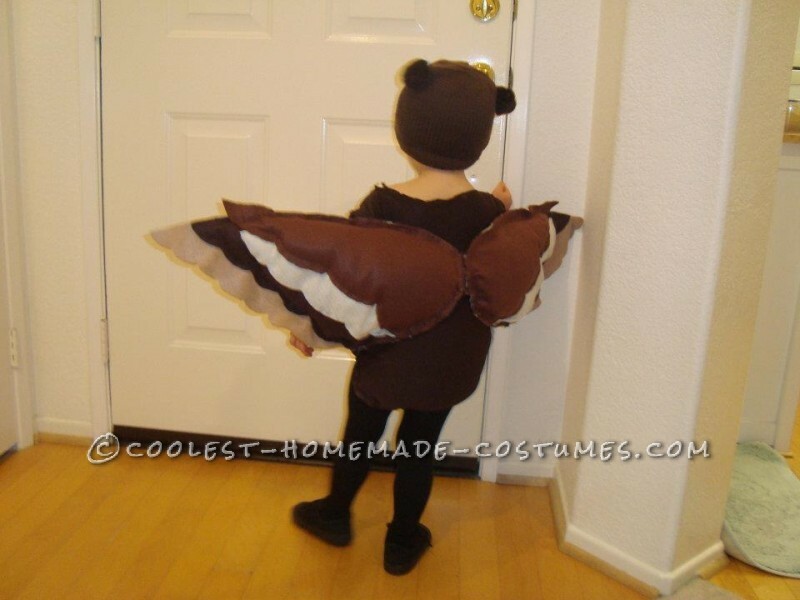 For the wings I used the different shades of brown felt. I cut the largest part first and each color got smaller to create the layered feather effect. I also stuffed each layer as I went to femmake them pop. I hot glued them together. I cut 2 strips of elastic and glued them on to make straps so the wings were wearable on the arms. 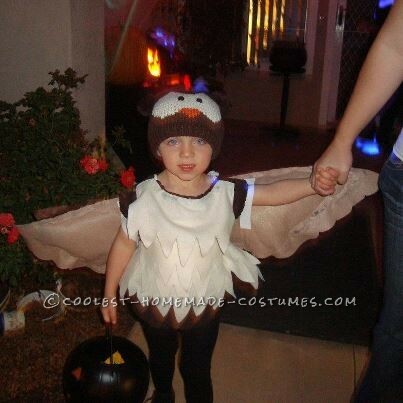 I topped it off with an owl beanie and black leggings and VOILA we had the coolest/cutest owl around! Everyone LOVED the owl costume. people knew what he was as soon as he walked up and we couldn’t get very far without someone stopping us to ask about it.